Un cas de leontiasis ossea (craniosclerosis). Haarlem : Erven Loosjes, 1883. Description : -27 p. [6 l.] pl. ; ill.: 6 phot. ; 29.7 cm. Photograph : 6 printed cards with photogravures. Photographer : Carel Eduard Daniëls. Subject : Skull — Leontiasis ossea ; craniofacial polyostotic fibrous dysplasia. Author caption: observé et décrit par C. E. Daniëls, Doct. Méd. à Amsterdam. Medical diploma, Hillegom at Leyden, 1862. Reprint: (1883), Natuurkundige Verhandelingen van de Maatschappij der Wetenschappen te Haarlem. 3. s., vol. iv., pt. 3. Photo caption (inscribed in negative): Phototypie, Wegner & Mottu, Amsterdam. Après plusieurs tentatives infructueuses, je réussis seulement, le troisième jour après la mort, à préserver la remarquable tête de la défunte des honneurs de l'enterrement. Immédiatement j'en fis faire la reproduction photographique, reproduction qui est très réussie et rend parfaitement l'expression que le visage avait pendant la vie.— Pages 5-6. After several unsuccessful attempts, on the third day after death I managed to save only the deceased's remarkable head from the honors of burial. Immediately I set about making the photographic reproduction, a reproduction that is very successful and renders perfectly the expression that the face had during life. 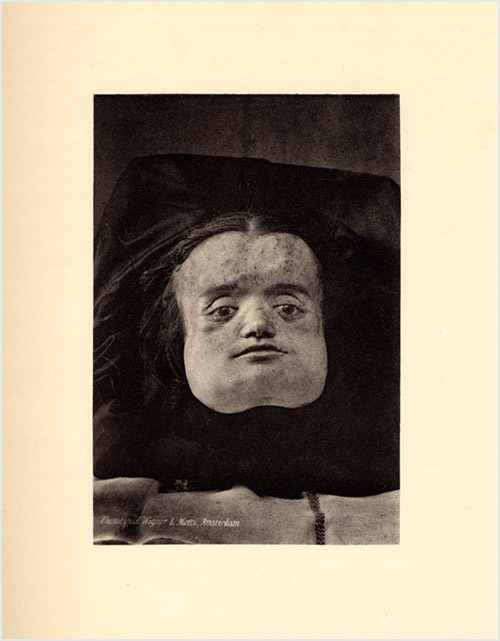 Daniels monograph is illustrated by six large format photogravures, Plate I representing the sectioned head of a 31 year old female as she appeared in life, her fades transmogrified by a cranial hyperostosis represented by five subsequent photographs of her skull. Daniels was a consummate scholar, the author of a number of works on the history of medicine, and the archival evidence and bibliography he provides is impressive, beginning with the first description of leontiasis ossea credited to Malpighi (Opera posthuma, published in 1700 ; GM 4299).